The past week brought a slew of both frightening and exciting advances in space technology around the world. India joined a list of only 4 countries to ever shoot down a satellite orbiting Earth. SpaceX successfully tested its Hopper rocket module and will launch the Falcon Heavy rocket for the second time on Sunday evening. A Japanese spacecraft used explosive charges to make a crater on an asteroid. Additionally, Israel’s Beresheet spacecraft entered the moon’s orbit in a nerve-wracking maneuver. On March 27, India’s Ministry of Defence successfully conducted an Anti-Satellite test from Kalam Island in Odisha. The test, dubbed Mission Shakti, was meant to establish India’s place among the world’s current space powers. By conducting the mission, India became one of only 4 countries to ever shoot down an orbiting satellite. The list includes the U.S., Russia, China, and now India. The missile was able to hit a satellite orbiting 283 km above Earth’s surface to 10 cm of accuracy. After the test, India’s Ministry of Defence released a comprehensive video presentation covering the inception of the mission to the destruction of the satellite, and the report included detailed descriptions of the missile technology. While the Ministry of Defence claims any possible debris created by the test will be unproblematic and quickly dissolved, officials at NASA disagree. NASA Administrator Jim Bridenstine stated the test was “unacceptable”, and the debris posed a risk to the ISS and human spaceflight in general. On the other hand, Lieutenant General David Thompson, vice commander of U.S. Air Force Space Command, previously stated that the ISS was not at risk. This situation mirrors China’s 2007 anti-satellite test, in that China’s test created about 2,000 pieces of trackable space debris, some of which came within only 6 km of the ISS. This week, SpaceX tested a lower section of Starhopper, a prototype of the next-generation reusable Starship. 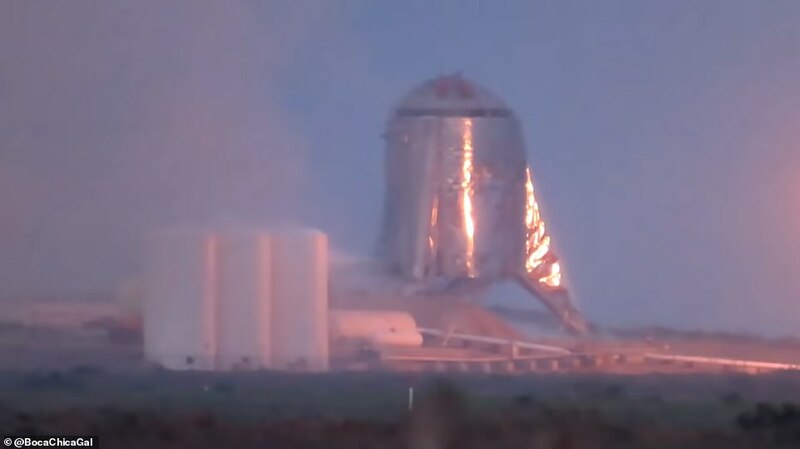 The test only lasted a few seconds, in which a Starhopper lower section ascended a limited distance and remained tethered to the ground. The test is part of a series of tests which will see Starhopper ascending to higher altitudes and landing. Additionally, SpaceX will launch Falcon Heavy, a reusable rocket, for the second time on Sunday evening. The launch will take place at the Kennedy Space Center. Falcon Heavy first launched on February 6, 2018, from Cape Canaveral. At that time, the launch was a demonstration of the rocket’s ability to lift a heavy payload. In fact, Elon Musk claims Falcon Heavy is quite literally the most powerful rocket in the world by a factor of 2. Sunday’s launch will actually be carrying a client payload from Saudi Arabia. Falcon Heavy will launch with a Saudi Arabian communication satellite on board. 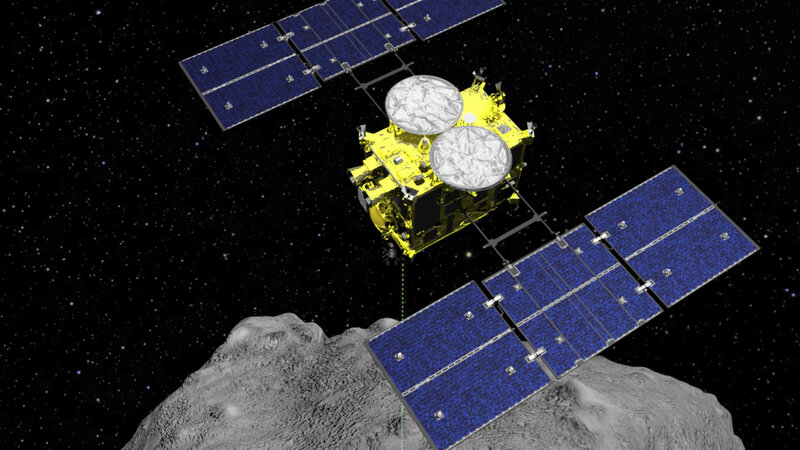 On Friday, Japan’s Hayabusa2 spacecraft deployed a small explosive package in the Ryugu asteroid. The explosion was conducted to form a crater on the asteroid’s surface so the spacecraft can collect underground samples from the asteroid. After deploying the explosives, the spacecraft had to move away from the asteroid to avoid potentially damaging debris. Japan hopes that samples collected from the asteroid will help them better understand the history of the solar system, as asteroids are remnants of the solar system’s formation. The Hyabusa2 is scheduled to leave the asteroid in late 2019 and return to Earth in 2020. Israel’s SpaceIL Beresheet spacecraft entered lunar orbit on Thursday, making Israel the 7th country to ever enter lunar orbit. The maneuver was arguably one of the harder parts of the mission. SpaceIL stated that they are happy with the maneuver’s success, but it will still take many hours to confirm Beresheet’s path. The maneuver involved a rapid deceleration using reverse thrust to slow the craft from 8,500 km/h to 7,500 km/h. The craft is still about 400,000 km away from its landing point on the moon. If Beresheet successfully lands on April 11, it will be the first time a privately funded mission lands on the moon. Overall, space technology is continuing to advance quickly and efficiently. Both space weaponry and space travel methods made great strides this week all over the world, and this global involvement shows that space is becoming increasingly intertwined between several nations. As such, we need to start establishing standards of interaction in space, and the sanctity of space itself must be protected from international conflict. While technological advancement is exciting, it must be closely monitored and guided towards the positive advancement of human capabilities in outer space. Kartik is a new sophomore at St. Mark’s School. He lives in Shrewsbury, Massachusetts and is a boarding student. He enjoys rowing, watching movies, and reading about current events. He is a member of St. Mark’s A Capella and enjoys singing for the school choir. In his free time, Kartik likes to work out with friends. This year, Kartik hopes to be a thoughtful contributor to the Parkman Post and create content which highlights unique perspectives on the news.